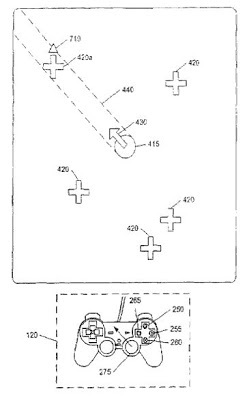 The ‘589 patent allows a player to easily target and attack one or more enemies while playing a video game. Once an enemy is targeted, the player initiates the attack against the enemy regardless of whether the player’s character is facing toward the enemy or not. If the player has locked on to multiple enemies, the player can press a button and target a specific enemy. This also allows the player to quickly switch between enemies at the touch of a button. A video game player can easily target and attack one or more enemies in a video game environment. The player may quickly designate an enemy on a display screen as a target and associate the enemy with a controller button on a video game controller. When the game player actuates the controller button, a player character initiates an attack on the targeted enemy that is assigned or associated with the button. The character initiates the attack on the enemy regardless of whether the character is facing toward the enemy or away from the enemy. If multiple enemies are present and multiple controller buttons are available, the player can choose which enemy will be targeted and associated with a controller button. This allows the player flexibility in choosing which enemies to attack. The player can also associate additional enemies with different buttons on a controller. The player can then initiate successive attacks on the additional enemies by actuating the buttons associated with the enemies. 1. A method for causing a player object to target and attack one or more enemy objects in a virtual environment, comprising: displaying a target range indicator that defines the target range of the player object, the target range indicator comprising a bounded area that encompasses a region of a display screen; maneuvering the target range indicator toward a first enemy object so that the first enemy object is at least partially located within the region of the display screen that is encompassed by the bounded area of the target range indicator; associating the first enemy object with a first button on an input device according to a button hierarchy, the button hierarchy prioritizing plural buttons on the input device in a predetermined priority order wherein the first button is the first button in the priority order; maneuvering the target range indicator toward a second enemy object so that the second enemy object is at least partially located within the region of the display screen that is encompassed by the bounded area of the target range indicator; associating the second enemy object with a second button on the input device according to the button hierarchy, wherein the second button is the next button in the priority order after the first button; and causing the player object to attack an enemy object when the button associated with the enemy object is pressed.